How time flies! It’s been a whole year since I made a Fruit “Cake” for my mum’s birthday and I needed another cake alternative for this year. 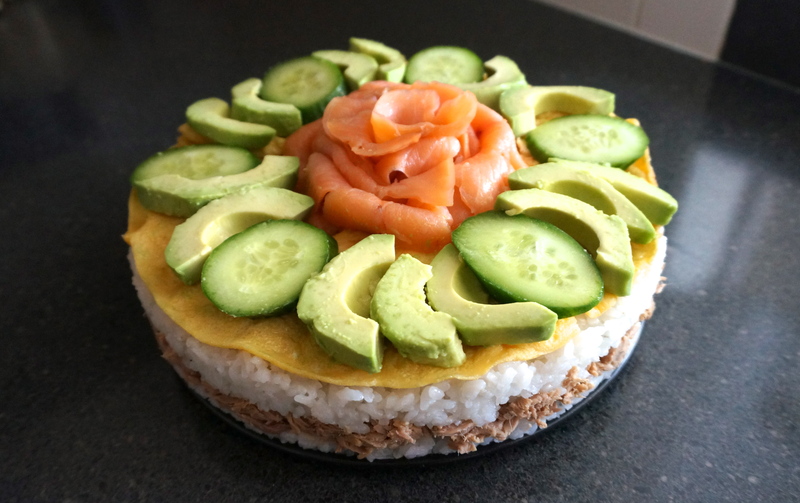 I saw a savoury sushi “cake” at a work lunch a few years ago and I remember thinking to myself: THIS IS GENIUS! 1. Rinse rice under cold running water (stirring occasionally with your hand to remove any excess starch) until water runs clear. Drain well. 2. Place rice and water in a rice cooker to cook (easy option), or in a large pot to cook. If cooking in a pot, have the pot covered and bring to a boil. Reduce heat to low and cook (covered) for 15 minutes or until the water is absorbed. (If rice is still not soft, add more water) Remove from heat. Set the rice aside and allow it to cool slightly. 3. Using a wooden spoon, gently fold in sushi vinegar. 4. In a loose base cake pan, place half the sushi rice on the base of the pan. Layer on the tuna and then layer on the remaining sushi rice. 5. Make an omelette from the eggs (I added a splash of soy sauce to my omelette), and place the omelette on top of the sushi rice. 6. 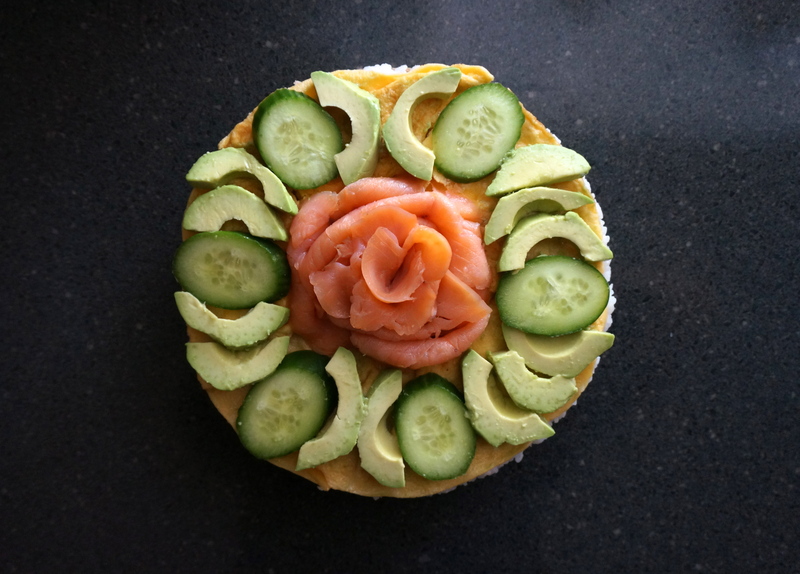 Arrange the smoked salmon, cucumber and avocado on top of the “cake”. 7. Remove pan from around the “cake” and serve. Brilliant idea! My boys would love this, and me too!